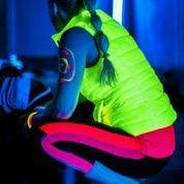 Blacklight Vinyasa Yoga. Take your practice to a whole new place by exploring your practice in a different kind of light. Some kind of Vinyasa experience recommended. Wear white or neon clothes for your best glow. Arrive early and have body paint added for the best sparkle!